This is the week United States ‘Rotaxians’ dream about for nearly 364 days of the year. 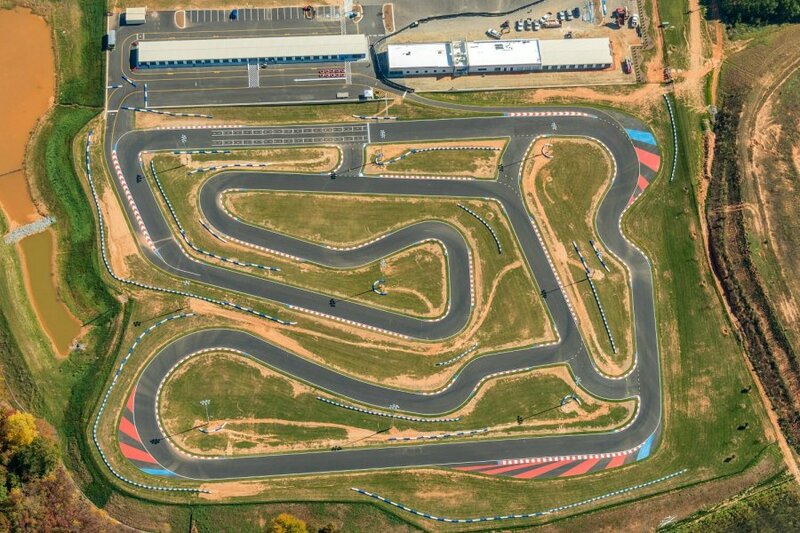 The 2013 United States Rotax Max Challenge Grand Nationals officially gets underway July 31 as the four-day event is contested at the new GoPro Motorplex in Mooresville, North Carolina. Drivers in seven Rotax Max Challenge categories will be competing for a chance to claim a national championship. The GoPro Motorplex was opened in October 2012, and has become a pristine center for karting in North America. Located in the heart of NASCAR country, the facility is growing the sport and in its inaugural season, hosting major events including the US Rotax Grand Nationals. The circuit at the GoPro facility is based on the famous Kartdromo Parma in Italy. At 7/10-mile, Justin Marks and his entire team developed a course that provides for some great racing and challenges the drivers. Competitors began traveling to the Mooresville area over the weekend, setting up for unofficial practice held Monday and Tuesday. Wednesday begins the official practice for the nearly 200 competitors, setting the stage for the remaining three days. Qualifying and the first round of heat races are held on Thursday. Friday is the final two rounds of heat races to set the stage for Championship Saturday. The final day will host a Prefinal, which will provide the lineup for the main events. On the line, aside from national titles, will be tickets to the 2013 Rotax Grand Finals, held in the United States for the first time. In November, the top Rotaxians from around the world will converge on the NOLAMotorsportsPark facility in New Orleans, Louisiana. The top two drivers in the Senior Max, DD2, DD2 Masters and Junior Max categories will be awarded spots at the event, while the top Masters Max pilot will earn a ticket as well. 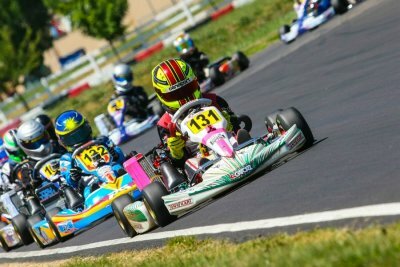 The top-three drivers in Mini Max and Micro Max will be provided a spot to compete at the event, as part of the North American invitational event. 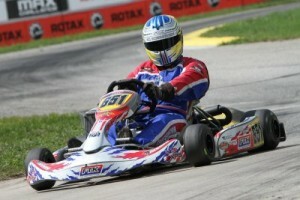 The 2012 edition of the US Rotax Grand Nationals saw a dominant performance by Daniel Formal in South Bend. With his absence to the Senior Max roster, the title is up for grabs once again. The last two winners before Formal lead a 36-driver field battling for the crown. 2011 winner Nick Neri (Tony Kart) returns, seeking his second in the Senior category, and fourth overall to tie Jordon Musser’s record of four. The Ocala Gran Prix driver missed out on Team USA and the Rotax Grand Finals, placing fourth in South Bend, and redemption is on his mind. Neri is also the EKN Driver Diary feature for the event, with updates directly from the Florida driver each night in the EKN Event Page. 2010 champ Stepanova Nekeel (FA Kart) bought the chassis at the event, found the sweet-spot and avoided trouble to score the big victory. 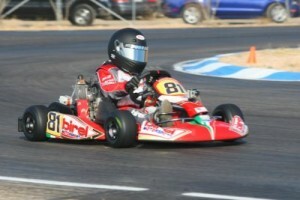 He finished fifth behind Neri last year, missing out on his chance at a return to the Rotax Grand Finals. Next to Formal on the podium were Sam Beasley and Andrew Palmer. Beasley is a three-time runner-up, from year’s 2010 to 2012. Each time, he’s come just short of winning. 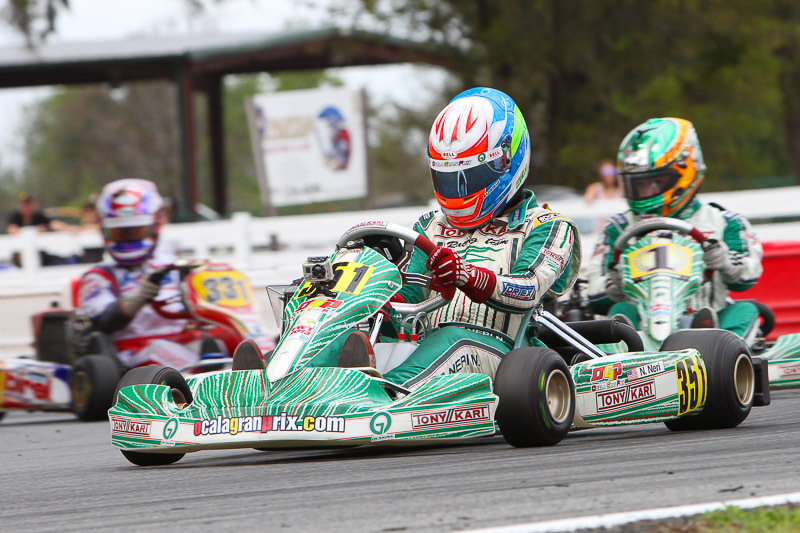 A move to the Ocala Gran Prix operation, piloting a Tony Kart could be the change needed to put the Ohio driver on the top step. Palmer (Kosmic) drove a stellar race to edge out Neri for the final podium position. Numerous tests and a victory at the Rotax Summer Shootout puts Palmer on the short list of top contenders. Among the young guns making their first Senior start is 2012 Team USA member Oliver Askew (Tony Kart). The Florida driver showed his talents against the Florida Winter Tour competition, and looks to transfer that to the Rotax Grand Nationals for his first title. Among the eight registered in DD2, all but one will be making their first start in the category which will lead to a new Grand Nationals champion. The one driver making his return, and has been close multiple times before is Nathan Mauel (CRG). The Oklahoma driver is among the original ‘Rotaxians’ in the United States, having been a member of Team USA five times, but never a victor at the Grand Nationals. One driver familiar with that achievement is defending Senior Max champion Daniel Formal (Kosmic). He is one of two drivers to win at three different categories (Mini Max, Junior Max, Senior Max), and is attempting to be the first to win at all four levels, and tie Jordon Musser with four total US Rotax Grand Nationals victories. They will be chased by a swarm of Sodi Kart entries, all from the LoneStarState. Alex Tartaglia is a three-time Texas ProKart Challenge winner this season, and will be joined under the Dallas Karting Complex stable by Sean Owens and Michael Ilavia with CJ Cramm rounding out the Texans. Evan Polisky is second in the EKN Rotax Driver Rankings thus far on the season, coming out of the F1 New Jersey USRMC, and will make his first Grand Nationals start in DD2. The DD2 Masters division is also full of veterans, looking to make a return to Team USA. 2012 champion Alan Rudolph (CRG) is set to defend his crown, already locked in on Team USA with his championship at the Rotax Challenge of the Americas program. Last year’s runner-up Rene Martinelli (CRG) and fourth place finisher John Crow (Kosmic) were Rudolph’s teammate last year in Portugal, representing the United States at the Rotax Grand Finals. They would much like to duplicate that, with either a podium finish or a victory. Mike Jones (Sodi Kart) made his DD2 debut last year, only to retire after two laps. Back for redemption, the Texan will be a factor all weekend. Another contender, switching from Masters to DD2 Masters is Paul Bonilla (Arrow). A multi-time podium finisher at the Grand Nationals, Bonilla could be one of the two drivers to earn a spot on Team USA. 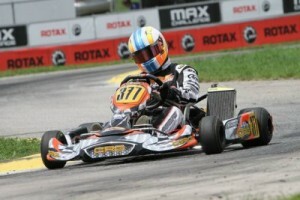 Current EKN US Rotax Driver Rankings number one driver Lance Lehrman (Sodi Kart) will make his Grand Nationals debut. The largest group of the 2013 US Rotax Grand Nationals is the Junior Max with 53 drivers. With recent and former winners moved on, this year will crown a new champion in the category. Three of the top-five from last year return, all gunning for the first step of the podium. Thomas Issa (Kosmic) was solid a year ago in South Bend to place runner-up, representing Jamaica at the Rotax Grand Finals. This winter, Issa already gained a spot at this year’s event in New Orleans with the Florida Winter Tour championship. Placing fourth a year ago, Juan Manuel Correa (Tony Kart) earned a spot on Team USA, and made it count by placing 22nd in Portugal. 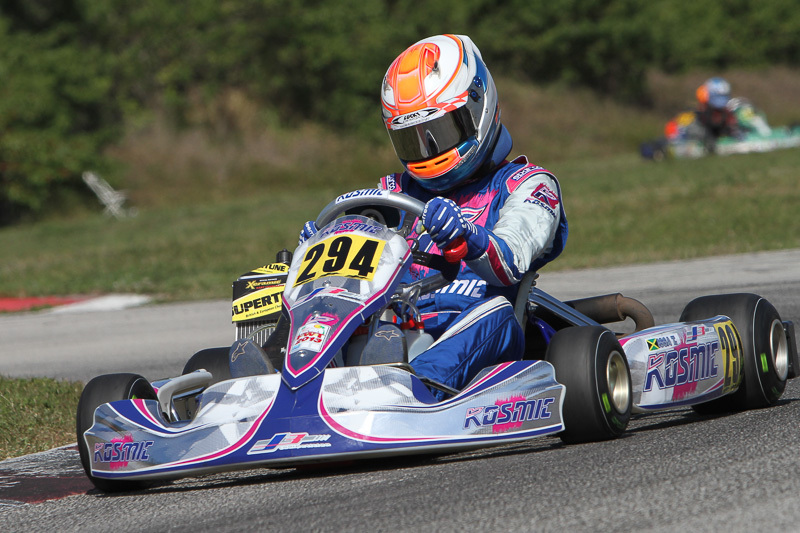 Fellow Floridian Austin Garrison (Tony Kart) placed fifth a year ago, a returns for a better finish in 2013. Among the list of contenders includes Ocala Gran Prix driver Ashley Rogero (Tony Kart). The 2012 Pan Am Challenge champion has been racing part of the season in Senior categories, outside of the USRMC, and faired well. Back in May, she won $5,000 at the GoPro Be a HERO Karting Challenge in Mooresville, beating out a talented field. Antoni Ptak (Birel) and Jack Weprin (FA Kart) have been competing overseas at the Rotax Euro Challenge, and will take their experiences to good work this week. Six of the top-10 in the EKN US Rotax Driver Rankings will be onsite in Mooresville for the Grand Nationals. Number one driver McKay Snow (Kosmic) is part of the stellar Junior roster that the Rolison Performance Group is fielding. The Utah driver is joined by Challenge of the Americas title winner Blaine Rocha, provisional Can-Am Karting Challenge champion, each who has a ticket locked for the Rotax Grand Finals. Colorado driver Grant Copple, EKN’s May 2013 GoRotax.com Driver of the Month award winner, rounds out the team’s Junior drivers. Two former champions are in the field, that is Mini Max title winners. 2011 winner Christian Brooks (ART GP) is making his return to the US Rotax Grand Nationals, for his first start in the Junior Max category. Jordan Perry (Tony Kart) won at New Castle, Indiana, and is also back at the nationals after a year away. The 2013 Masters Max action will possible crown a new champion, with no current returning champions in the field. Despite that fact, six of the top-10 from last year are set to contend for the championship. Runner-up last year, Andy Seesemann (Arrow) will continue his streak of competing at every US Rotax Grand Nationals, and the Full Throttl Karting owner/driver hopes for a second title to add to his 2004 achievement. Diego Pelosi (FA Kart) was third in 2012, and certainly has shown the speed to be a contender. The Californian was a double winner at the Rotax Challenge of the Americas. Chris McGinley (Kosmic) is the highest ranked EKN US Rotax Driver Rankings driver competing at the Nationals, entering second. The New Jersey driver finished eighth last year, behind Bobby Greene (Maranello) and Rob Maier (Tony Kart) who are also returning. Utah driver Justin Peck (Tony Kart) earned his first major victory of his career at the Rotax Challenge of the Americas. Another driver to watch will be Tyler Brooks (Tony Kart), another double winner at the Challenge program out west. Adding some flavor to the event, motorsports driver Max Papis (Tony Kart) will be competing in the category. A Mooresville resident and frequent customer at the GoPro Motorplex, the Italian may have the slight advantage on the field this week. A solid 34 drivers fill out the Mini Max entry list for this year’s US Rotax Grand Nationals. 2012 champion Anthony Gangi Jr. will not defend his title this year, leaving the top spot on the podium open to any one of the drivers making the trek to Mooresville. The only returning podium finisher who will be in North Carolina, looking for the number one position, is Mathias Ramirez (Tony Kart). Second last year, the Florida driver faired well this winter placing third in the Florida Winter Tour. Those drivers who looked great this winter included Sting Ray Robb and Nick Brueckner. Robb (Tony Kart) was the Rotax Challenge of the Americas champion with Brueckner (Birel) – the 2012 Micro Max US champion – besting the Florida Winter Tour fields. It will be some familiar names in contention for the Micro Max title. Many of the top drivers from a year ago are returning, while it’s expected to be a battle all week long. It could be a battle of West vs. East between the two Rotax Challenge of the Americas and Florida Winter Tour champions. Utah driver Payton Durrant (Birel) won four of the six races out west, while Giovanni Bromante (Top Kart) scored four podium finishes to win the title in Florida. Other drivers to watch include SKUSA SummerNationals double winner Dylan Tavella (Tony Kart), Harry Coulton (Birel), Filip Niemkiewicz (Energy), Nicholas d’Orlando (Tony Kart) and Alex Verhagen (FA Kart). Rob is this entry list revised? Can Howard race now? Was Louie cleared too as well? Matt…David and I are both currently en route to Charlotte (I’m actually waiting for him at the airport), so we haven’t hit the track yet. That said, it appears that Pagano will not be racing. I would expect that Howard may run into the same issue. We’ll get the full scoop once we get to the track this afternoon. Stay tuned for a full update. Thx Rob. Enjoy the event and be sure to post your best meals for us to add to our track notebooks. No worries, Matt. We’ll hook you up. I actually received a great email from Mooresville resident and top TaG Master driver Chuck Grafarar with a list of some great food joints, and we’ll be hitting them this week!